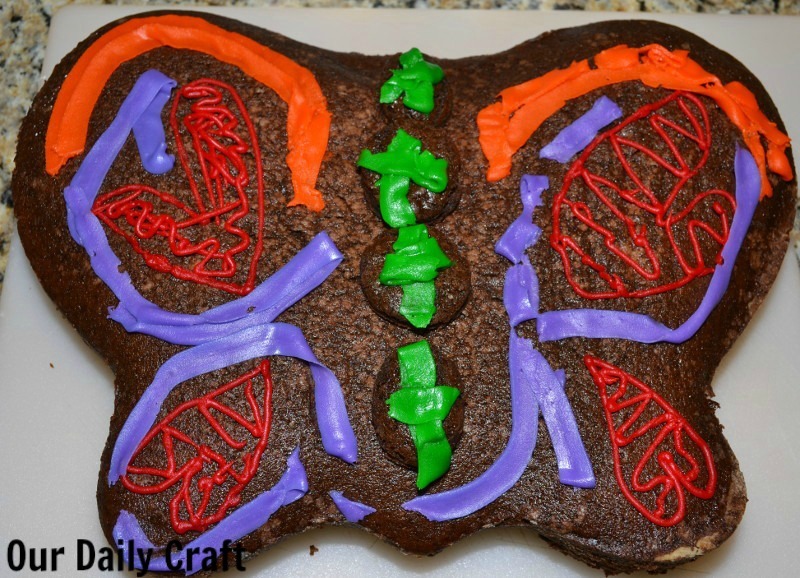 The girl just turned seven, and she decided this year she wanted an at-home party with the theme of butterflies. 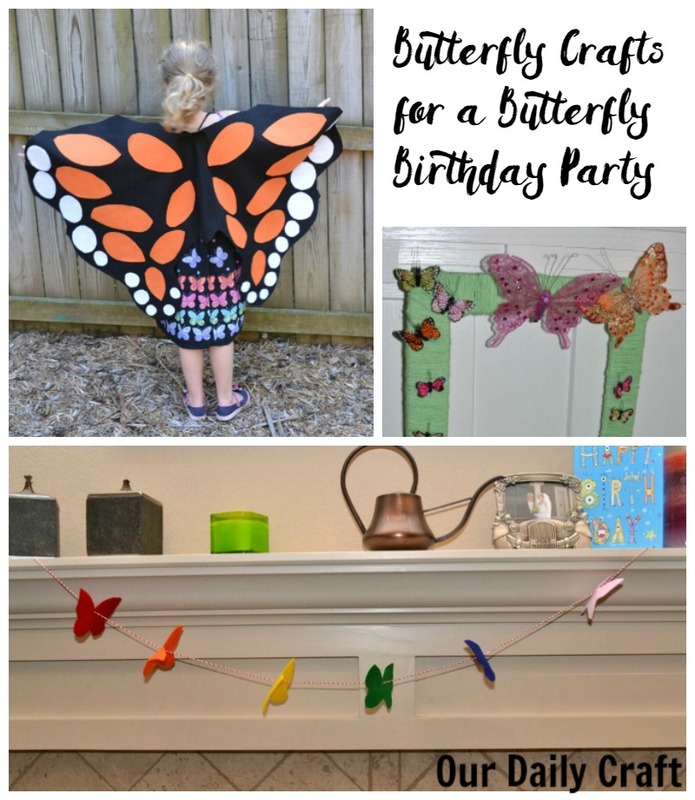 I made a few cute butterfly crafts to go with the theme that she just loved, so I thought I would share them with you in case you have a butterfly birthday party coming up or just know someone who loves butterflies! 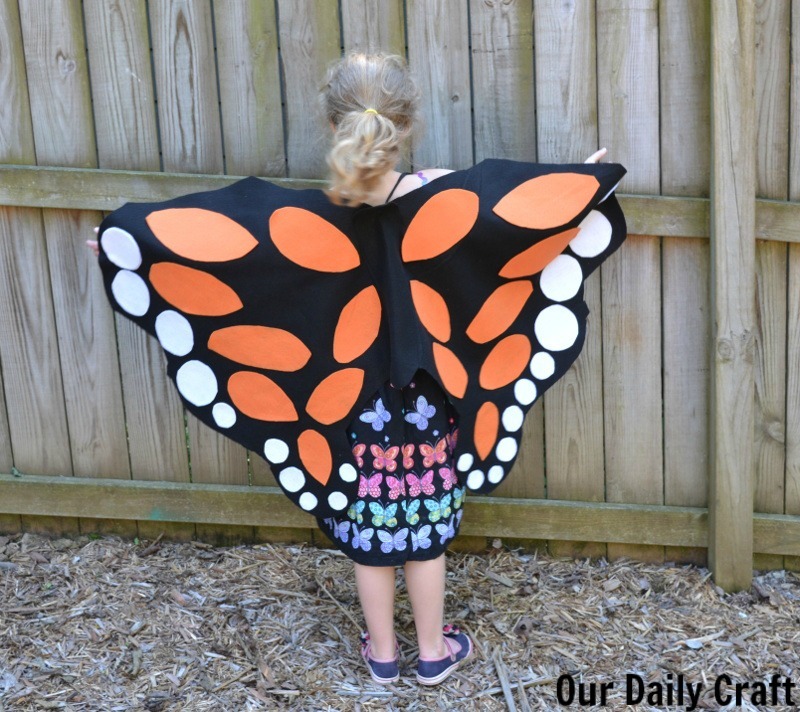 I had seen these felt monarch butterfly wings from Buggy and Buddy on Pinterest a while ago, and I had always wanted to make them, so I decided this was the right time. The tutorial over there doesn’t have a real pattern, just explains how to do it. It’s a big project but actually really easy because the embellishments are attached with spray glue rather than by sewing. The girl helped draw and cut out the wing shape and supervised the placement of the other elements. She loved them, but it was a little warm to wear them at her outdoor party. I’m sure they’ll get a lot of use as a dress up item in the future. Under the wings she wore her style in an instant dress I made a few months ago. What’s a butterfly birthday party without a butterfly wreath at the door? 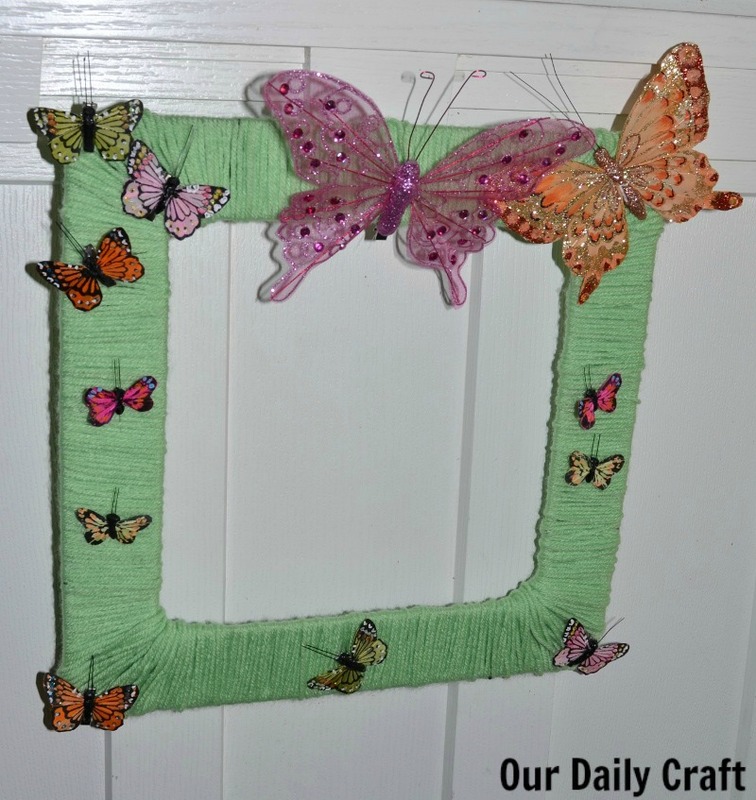 I decided to make mine with a square metal wreath frame, some green yarn and butterflies from the floral department (all of this came from Jo-Ann except the large pink butterfly, which came from Dollar Tree). Whatever shape or type of wreath you use, wrap it completely with yarn. It isn’t easy to completely cover the corners of the square frame, which is why all of mine are covered with butterflies. The floral department butterflies all have clips or pins so you can just stick them in the yarn wherever you want. This would be a great wreath for spring, too, and will definitely be coming out again next year. The last butterfly craft I made was rather last-minute (as in I made it the day of the party). 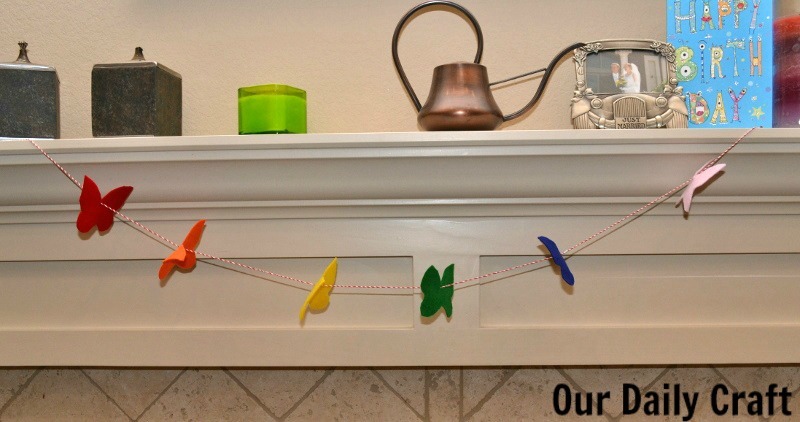 I thought the fireplace needed something so I cut out butterfly shapes (the 3-inch size from this template from Chica and Jo) in rainbow colors of felt, plus pink because I had it. I used red and white twine for the string and a semi-sharp needle to poke holes in the felt for the string to go through. I think it turned out pretty cute and only took a few minutes to pull together. In all the party was a great success, and my little butterfly had a great time. She even decorated her own cake! Next PostCreativity Boost: What Can You Give Up?